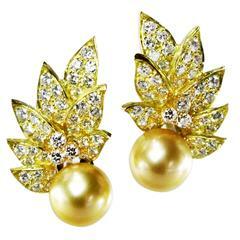 Golden South Sea Cultured Pearl Diamond Gold Ear Clips. 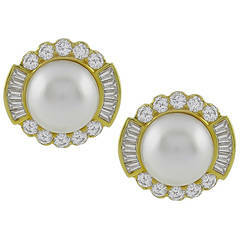 South Sea button pearl diamond gold ear clips. Showcasing a pair of South Sea button pearls measuring 11.65 mm, within a diamond border comprising eight round diamonds set at equal intervals, in turn, each inside its own diamond halo, the color of the metal of the halos themselves alternating in sequence from white to bright yellow, to white again, to bright pink and so on, together all the diamonds totaling approximately 3.50 carats, approximately H – I color and VS – SI clarity, mounted in 18-karat gold with omega clip backs. We love the eye-candy quality of these elegant, sophisticated earrings, and that the use of such bright yellow and pink gold colors teases the eyes into believing that the diamonds that are set in them are pink and yellow themselves. But it is all an optical illusion. We also like those big, creamy white pearls with their lush bright nacre and smooth skins. In all, we find it hard to resist the allure and sparkling display of these neatly arranged pearls and diamonds. Very pristine condition consistent with age and wear. Celebrate Yourself and consider these delicious earrings as your own personal treat for Yourself today. And if that won’t be the case, just imagine how Happy you will make that special woman in your life by gifting these outstanding South Sea pearl and diamond earrings as a token of your loving care and affection. It will make you Happy too. Knowing that you have chosen with love in mind. For over thirty years, we have been in the business of making people Happy by selling a carefully curated collection of antique and estate jewelry. That is what it is all about, from our good taste to yours! DIMENSIONS: approximately 1” diameter overall, omega clip backs. 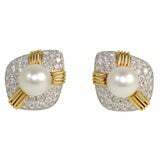 Ear clips set with 82 round diamonds weighing approximately 3.50 carats, and 2 south sea natural color golden cultured pearls 12mm.